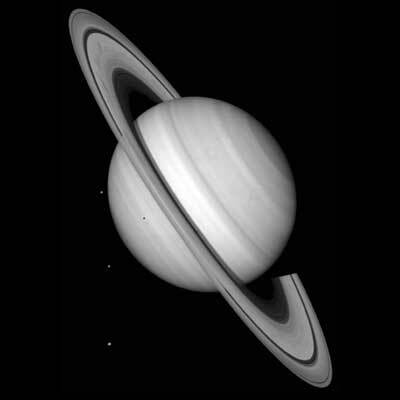 Saturn is chiefly composed of two gases and has no real solid surface. It is 96% hydrogen (H2), 3% helium (He) and 1% other elements. Its very low density means that it would float in water. Saturn’s core is likely a mixture of rock and molten metal at a temperature of more than 11,700°C and spanning around 25,000 km. 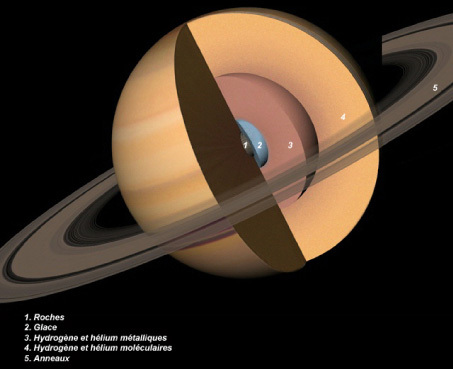 The outer core is fluid metallic hydrogen (atomic hydrogen) forming a liquid-metal and electrically conductive ocean with currents generating Saturn’s powerful magnetic field. Next comes a layer of liquid hydrogen at 6,000°C, formed by gradual condensation of molecular hydrogen (H2). The final layer is the atmosphere, chiefly composed of hydrogen and helium gas, with clouds formed from the condensation of various chemical elements including ammonia and water. Winds here may attain speeds of 1,800 km/h. 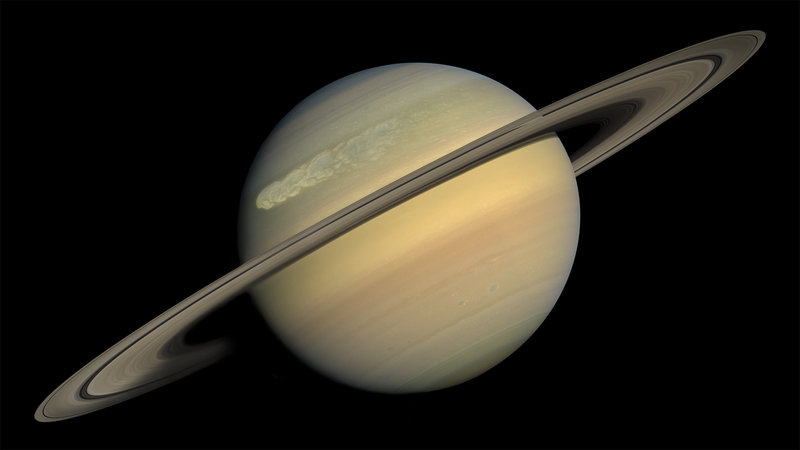 Saturn also has the largest system of rings in the solar system (it’s A ring spans more than 270,000 km). These rings are around 1 km thick but may thin locally to only a few tens of metres. They are made up of billions of fragments of water ice, and each large ring is composed of multiple smaller and narrower rings. The main rings are separated by gaps composed of dark materials. The main gaps are created by resonant effects with moons lying further outside or inside the ring structure. 62 officially recognized satellites form the Saturnian system. Of these, 7 are large enough for gravity to have given them a spherical shape: Mimas, Enceladus, Tethys, Dione, Rhea, Titan and Iapetus. Titan is the only moon in the solar system with a dense atmosphere, composed chiefly of molecular nitrogen and some methane. It has a complex climate cycle, with methane at its surface and liquid ethane that evaporates and then precipitates in the form of ‘rain’. The surface is mainly ice and its mean temperature is –179°C. Spanning 5,150 km, Titan is also the largest of Saturn’s moons, orbiting at a distance of 1.2 million km and taking 15 days and 22 hours to complete one revolution. Credits: NASA/JPL/University of Arizona/University of Idaho. Saturn and its moons Mimas, Enceladus and Tethys pictured by Cassini. The Cassini-Huygens mission is exploring the structure and environment of Saturn and its moons. Launched in 1997, the Cassini orbiter released the Huygens probe onto the surface of Titan. CNES is contributing significantly to this mission, as it is involved in half of the science experiments on the orbiter and lander. 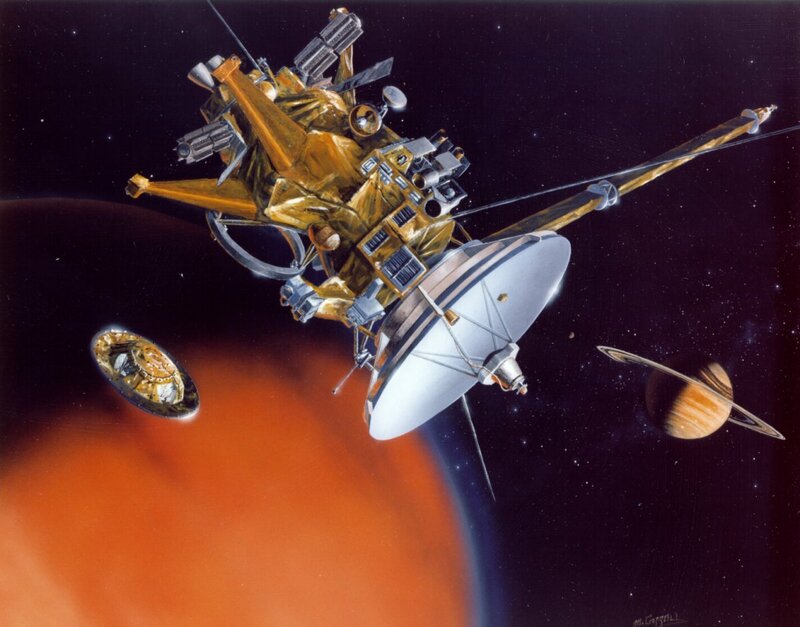 The Huygens probe separating from the Cassini orbiter.